The concept of role has been a source of tremendous angst for many people in the Bujinkan over the years. Roles are considered to be a building block of sociology as an academic discipline, and so it might be informative to examine how sociology could inform our participation in the Bujinkan. Roles are characterized by four unique traits, according to the sociology literature. First, roles are reciprocal. A leader cannot be a leader without someone to lead (i.e., a follower). A manager cannot exist without at least one person to manage. And a husband cannot be considered a husband without a spouse. Because roles create a point of distinction between the person in the role and others not in the role, roles usually accompany status. This linkage between role and status is why workers are willing to work harder for the same money if superiors give them a title; status is valuable and roles are linked with status. Bringing the concept of roles into the dojo, naturally one cannot be a teacher without having a student. But at the same time, one cannot claim to be a “student of Budo” without having a teacher. And I am not talking about someone that you see once a year for an afternoon. You cannot be a student without having a teacher—someone who regularly corrects your mistakes and keeps you on the correct path. Second, roles are contextual. The way you converse with your high school friends is not the way that you converse with your grandmother. When you are with your high school friends, you are adopting the role of “friend,” but when you are with your grandmother, you are adopting the role of “grandchild” or “family member.” These are very different roles; each has its own language and acceptable norms of behavior. If you speak to your grandmother in the same way that you speak to your high school friends, then you might be reprimanded by a parent as being rude or disrespectful. That is because you are acting out the wrong role given the context in which you have found yourself. Understanding context is incredibly important if you are to have relationships with people from Japan. While most Westerners believe that they “know who they are,” Japanese might say, “How can you know who you are until you know who you are with?” When I am with college friends, I use the word “Boku” to refer to myself. When I am with those same friends in front of their bosses, I would use the more formal “Watashi” instead. Nothing has changed about me, per se, other than those with whom I am passing time. But that difference is really important. “I” change because of whom I am with. In other words, context matters. Third, roles come with rights. A right affords you an opportunity to act in a way that others may not act. If you take advantage of that right, then good for you. You are exercising your right, given your role. But if you elect not to take advantage of a right that comes with your role, you will not be punished. That is because rights are options, not requirements. At the same time, only role holders may exercise the rights that accompany a given role. If someone outside a given role attempts to exercise those rights, that individual will be punished. As a Shidoshi, for example, you hold the right to teach. You need not do so, however, and your choice not to teach despite being a Shidoshi will not garner sanctions or scorn. My first teacher, Keiji Nakadai, did not start teaching until several years after passing his Godan (fifth dan) test. In fact, I believe that he did not start teaching until he was Hachidan (eighth dan). Very few Westerners would consider putting off teaching after passing their Godan test. Instead, they see the right to teach as something that they must do to be a legitimate Shidoshi. But this thinking, unfortunately, is confusing a right with the fourth (and arguably most important) trait of a role. Fourth (and finally), roles come with duties. A duty is an obligation to act in a particular way. As described above, while failure to exercise a right bears no consequences, failure to perform a duty will bring about sanctioning and scorn from others who hold expectations of the actor in the role position. About a decade ago, a very high ranking practitioner of our art committed an egregious violation of his role in the Bujinkan. In an interview, this practitioner stated that he would ignore Soke‘s admonition not to train with a given teacher, who was being punished for his inappropriate behavior. 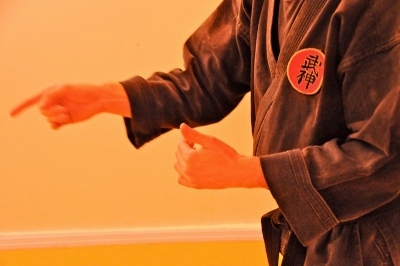 By publicly coming out against Soke‘s wishes, this practitioner was not only violating his own duties, but also he was preventing Hatsumi-sensei from fulfilling his own role as Soke. That was a double whammy of a mistake, and deserved the scorn of the entire Bujinkan community. Naturally, many people balk at being reminded of their duties. Americans especially have a tendency to focus solely on the rights that they have earned (in a given role) and strategically ignore the duties that they also bear (in that same role). On more than one occasion, I have had heated disagreements with people living in Japan who desire to have a voice on the Internet as a representative of someone training at Hombu, but do not want to bear any duties that accompany that role. These individuals covet the status that comes with taking on the role of “Japan-based Practitioner” or “Voice from Hombu,” but complain when people acknowledge that role by emailing them with requests for help (e.g., translation, directions, hints). You cannot enjoy only the rights of a given role and ignore the duties of that same role. The role embodies both. If you don’t like it, then don’t take on the role in the first place. Everyone in the Bujinkan has a role. Sometimes, some individuals may have multiple roles…at the same time. It behooves us all to consider deeply one’s role and how one can carry it out. No matter how many times we say it — it NEVER seems to sink in. We don’t serve Burritos or Tacos here. Ever. EVER. Ever. We like Alfredo and Linguini. You like Tacos and Beer. It’s ok. Most of us who have been around for awhile have had Tacos and Beer as well — so when we show up at the Italian place — it isn’t by accident. Anyone who is surprised that the BJK class is different than the Muay Thai class is an idiot. Yes. An Idiot. When you understand enough about Italian food to discuss it, let me know. Until then, enjoy your tacos and beer….SOMEWHERE ELSE. It is rude to bring another restaurant’s food in. Take a lesson in manners. Here is a complementary post by an individual who goes by the username Arashima. What Hissatsu and I are trying to say (and we will keep coming up with culinary and linguistic analogies until we are as blue in the face as smurfs) is that it seems impossible to talk ninjutsu/taijutsu with other people who practice ninjutsu/taijutsu without constantly facing demands by people from other arts to translate ours into the language of theirs in order that they may understand it, even though most of the time we don’t speak their language, only our own. Nobody seems to make the effort to try to understand or appreciate our art in its own context, but you don’t find us doing the same in other sections. I am reminded of new work colleagues who never learn the job because they are always harping on about what they did elsewhere and how great they and their previous company were. You have to let go of what you thought you knew and immerse yourself thoroughly in a new art and wipe clean any preconceptions before you walk through the door, which people seem to find extremely difficult on internet forums. As I said before, hardly anyone who is good at out art posts in youtube. If people have such a problem with a youtube clip, hello, but there is a facility on youtube to comment there. Don’t come and whine to us about it, because we didn’t post the crap, and cannot and should not neet to make excuses for those who do. And even when someone like Adam posts a decent clip of what is obviously kata training, he gets the usual rude and ignorant demands for his art to be translated to the lowest common denominator for armchair appraisal. And having to constantly justify ourselves for existing because sparring and competing is not the primary focus and end product of our training gets very trying after a while. Yes you are doing a good job of moderating (because nobody has left yet because of you) but if you as a Mod keep coming in with only the experience of Mexican and expecting us to provide you with a Mexican solution when we are only here in the Italian section to talk and eat Italian it just encourages more Mexican enthusiasts to keep coming and demanding Mexican food. If this were being played out for real, and the local sheriff (you) and local Mexican fans eventually made it unbearable for Italian cuisine afficionados, the proprietor would have no option but to give up on the Italian food and just sell Mexican just to stay in business, and those who wanted Italian would just have to go *elsewhere*. It appears that a particular *elsewhere* is under new management and awaiting its grand reopening, so you just have to ask yourself, do you still want the Italians to come and eat here or not? Especially when they have the Italian restaurant they wanted all along and which promises never to sell Mexican food. And if you don’t care if people stay or go, then you are saying you don’t care about your members. No baby, no bathwater, just a change of diaper when one is full of something unpleasant. Here is the thread source.